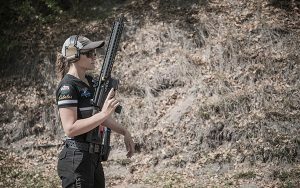 SIG SAUER Inc. congratulates Team SIG member, Lena Miculek, for her first place finish in the Pistol Caliber Carbine (PCC) Division at the 2018 SIG SAUER Pro Am Shooting National Championship held August 17th – 19th, at the South River Gun Club in Covington, Georgia. The 2018 SIG SAUER Pro Am marks the first competition Miculek used the newly released SIG SAUER Match Elite Pistol Competition Ammunition. To claim first place in the PCC Ladies Division, Miculek competed using a SIG SAUER MPX Carbine, ROMEO1 Optic, and the SIG SAUER Match Elite Pistol Competition Ammunition. The 2018 SIG SAUER Pro Am Shooting National Championship is a high-speed competition, with a challenging course of fire, devised of all steel targets, where the competitor has to continually move and reload. The SIG SAUER Match Elite Pistol Competition ammunition, used by Lena Miculek at the 2018 SIG SAUER Pro Am National Shooting Championship, is only available at sigsauer.com for $29.99 per box of 50 rounds. Cases of 10 boxes will be available for purchase.